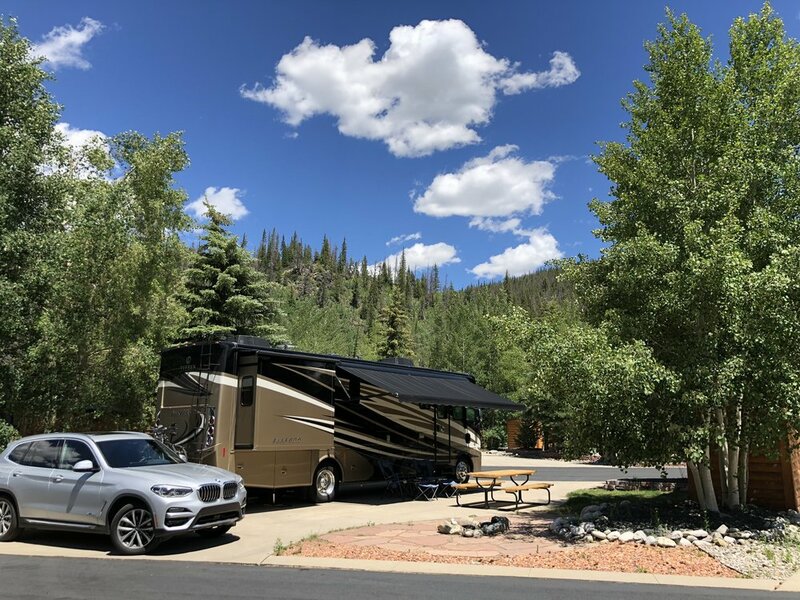 We just returned from our annual summer trip to Colorado, staying for the first time at our tiny piece of Rocky Mountain real estate: a campsite at Tiger Run RV Resort. As I discussed in this blog post, this long-awaited trip was the key element of our base camp concept, and I’m happy to report a successful experiment. Exploring that part of Colorado was new to us, and thanks to a stretch of beautiful weather, we spent a lot of time outside. Tiger Run is located on the bike trail between Breckenridge and Frisco, and that paved recreational path is also connected to the nearby towns of Dillon, Silverthorne, Keystone, Copper Mountain, and Vail. We rode nearly 200 miles and ascended over 9000 feet during our 2½-week stay; I have hours of video from those rides and need to find time to edit all that down to a short movie. Our most spectacular bike trip was between Vail and Vail Pass, a 30-mile round trip that included a steady ascent of 2600 feet. Frankly, we would never have tackled that without our pedal-assist electric bikes, and even then, it was a workout. The thin air was always a factor and most challenging for us during a 4-mile hike on Shrine Ridge Trail, where we reached an elevation of nearly 12,000 feet. 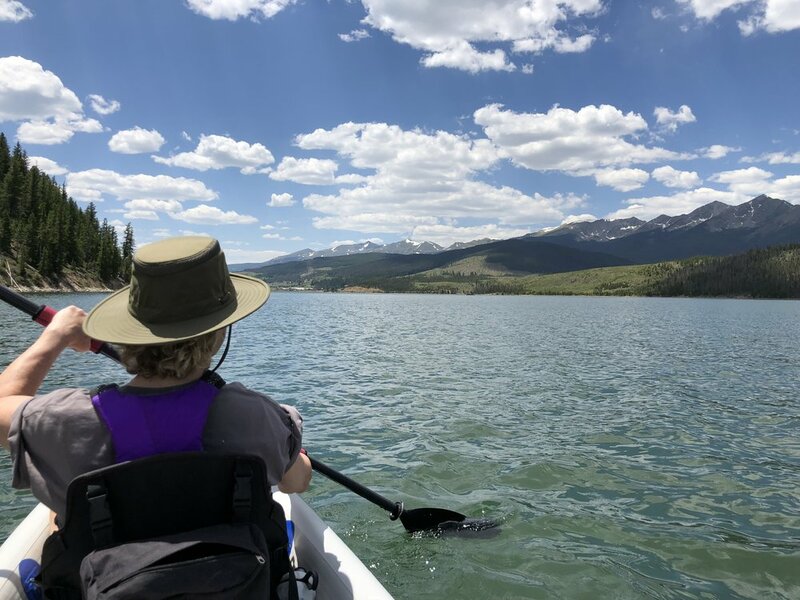 Back at 9000 feet on Lake Dillon, we paddled a total of 17 miles in our inflatable kayak, with spectacular mountain views in every direction. We did not drive the most direct route to Colorado, since we wanted to visit family and friends in St. Louis, Milwaukee, and Santa Fe. These plans created a familiar transportation challenge for us, since our 34-foot-long motorhome limits where we can drive and park. We don’t tow a car behind our motorhome, so we often take advantage of rental cars, Uber, public transportation, our bikes, or our feet. But it was clear we would need a car at each one of those cities in order to travel from our campsites to our family and friends’ homes, restaurants, museums, and planned events that ranged from a Milwaukee baseball game (Brewers vs. Cardinals!) to the Santa Fe Opera. So I employed our most common strategy: arranging car rentals for those cities as well as in Colorado, where we would be staying the longest. Right before our trip, while I was contemplating all those individual trips to pick up and drop off the rental cars (and the total expense involved in that), I started to think about another option: There are two of us . . . why don’t we drive both our motorhome and our car? I admit that this may sound ridiculous, but we have often used this strategy for shorter motorhome camping trips. Our SUV makes it easy to carry the kayak gear to launch points, and its hitch-mounted bike rack comes in handy for transporting our bicycles to trailheads. But it is not one of those cars that can be flat-towed or dolly-towed, and towing it on a trailer would exceed the weight capacity of the hitch on our motorhome. So having the car go with us means driving it separately, not towing it, and fortunately Virginia loves to drive. But does this make sense for a much longer trip that will cover 4700 miles and 80 hours behind the wheel? There is no single or simple answer to that question, but I like the analysis by Eric and Katie Nathey of Mountain Modern Life, with a thorough discussion of the advantages/disadvantages in this video. There’s even a name for this motorhome alt-tow travel strategy: “chasing.” On this trip, Virginia would often drive ahead of me to scout out RV-suitable gas stations; shopping center parking lots that could accommodate our motorhome; coffee shops or restaurants, where she would grab food for a coffee or lunch break; and the campground, where she would register us before I arrived with the motorhome. Since I limit the RV speed to 65 mph, Virginia's faster highway pace usually gives her time to choreograph these advance stops, and our mobile phones help make the coordination easy. For me, that means no more exiting the freeway only to discover that I can’t maneuver to gas station pumps, and no more hunting for a coffee shop or a grocery store only to find no place to park. This was a significant reduction in my stress level during our trip, and I think scouting is the main advantage of chasing vs. towing. I’ll mention two other major advantages to chasing, the first of which Eric pointed out in his video: Reverse! With a car in tow, you lose your ability to drive in reverse unless you take the time to disconnect the car. Frankly, I can’t imagine this – I use reverse every day that I drive the RV, whether that’s at a gas station, a parking lot, a campsite, or correcting a navigation error. The other major chasing advantage is cost: purchase and installation of towing and braking gear can cost thousands of dollars, and that’s if you already own a car that is towable. In our case, it’s almost unthinkable to trade in my car for a vehicle that can be towed, taking the depreciation loss on a car I use every day to gain a single feature that I would use only a small fraction of the days I drive. Obviously, this is the viewpoint of someone who uses their RV just for vacation time; I'm sure I would feel differently if I was living and traveling full-time in my motorhome. And of course there are disadvantages to this strategy, with this being the main issue: You and your driving partner are not sharing the experience of the trip behind the same windshield. Not only do you lose that road companionship and conversation, but this also means that no one can work, nap, use the bathroom, or raid the refrigerator while the motorhome is in motion. We tried to minimize this separation by coordinating stops at rest areas so that we could take breaks together, but we found this difficult in some states that have limited or eliminated their public highway rest areas. And rest breaks are important since you are each driving much more every day than you would if you shared the driving of a single vehicle. As I mentioned, chasing was a last-minute decision in our case, and we have been asking ourselves if we would do it again for such a long trip. With neither of us motivated to trade in our current non-towable cars, the answer is “yes” – but with a couple of modifications. First, we would plan shorter driving days than we currently do; and second, we would not plan more than two consecutive days of driving. With both of us functioning as solo drivers, this should reduce the chance of fatigue, though at the expense of adding travel days to our trip. We also expect that there will be some trips where we would still choose not to have a car with us. For example, when we have traveled to the Florida Keys, we did not have the same sort of multi-stop itinerary for sightseeing with family/friends, and we have only needed a rental car at our final destination. At least this trip to Colorado convinced us that chasing could work for a long/complex travel plan, not just short trips as we had done in the past.